Coastal wetland reclamation and the following cropping activities can dramatically affect soil physical-chemical properties. The tidal action builds up micro-relief (e.g., tidal creeks and flats) on a natural mudflat salt marsh. The micro-relief factors influence the edaphic process after reclamation, thus understanding and qualifying the effects of these factors (e.g. soil heterogeneity) is essential for the evaluation of environmental changes. This study adopts conventional statistical and geostatistical methods to determine the effects of typical micro-relief, which is broadly distributed on eastern coastal mudflat in China, on soil physical-chemical properties’ changes and heterogeneities in 17 years’ time. Seven typical soil properties including electrical conductivity, pH, soil bulk density, soil organic matter, total nitrogen, total phosphorous and total potassium were tested to reveal the changes of soil physical-chemical properties after cultivation. The results indicated that cropping activities significantly decreased soil bulk density, salinity and alkalinity levels and meanwhile, improved the accumulation of soil organic matter, total nitrogen and total phosphorous. Compared to tidal flat areas, the soils of tidal creek areas were characterized by worse porosity, higher salinity-alkalinity ratios and lower nutrient levels, whereas total potassium did not show significant affected by cultivation or tidal creek. The affected range of soil pH extended around tidal creek areas, and it was the direct reason limiting soil nutrients’ accumulations instead of soil salinity. This result suggests that, besides cultivated time, micro-relief is also an important factor to hinder the edaphic process, and it should be taken into consideration in future development decisions. Coastal wetland soils (or sediments) exhibit particular physical–chemical properties governed mainly by tidal dynamics. Under intensive human activities, great changes occur on soil properties and reveal an environment evolution in this process (Fernández et al. 2010; Iost et al. 2007). There are argues to evaluate whether the changes are positive or negative based on different objects (Mao et al. 2010; Wang et al. 2014b). Thus it is important to do a research on the relationships between impact factors and soil properties, in order to help us understanding the mechanisms in this process. As a land-gaining human activity, land reclamation of coastal wetland has been practiced for several hundred years worldwide (Pethick 2002). The studies at reclaimed regions concluded that soil properties’ changes could be affected by reclaimed times, land use types and special cropping practices (Yin et al. 2016), therefore soil heterogeneity existed at reclaimed zones (Li et al. 2013). Previous studies only considered human activities after reclamation as the main reason for soil heterogeneity (Sun et al. 2011), while ignored the heterogeneity on the original coastal wetland. Tidal actions create regional differences in deposition and erosion rates of sediments, and build up micro-relief (micro-topography, e.g. tidal creeks and flats). As a typical kind of micro-relief, tidal creek is a type of tidal channel, which forms on mudflat and is affected by the ebb and flow of ocean tides (Perillo et al. 2009). Although it was well known that tidal fluctuation could greatly change hydrology and ecological processes in coastal wetlands (Huang et al. 2015), soil properties’ heterogeneities affected by a tidal creek in a reclaimed zone was still kept unknown. China’s coastline spans over 3.2×104 km and is considered as one of the world’s most important coastlines. Jiangsu Province possesses a typical silty-mud coastline of 666 km with a mudflat that can grow by 13.3 km2 each year in a natural state (Zhao et al. 2010), and the tidal creek is widely distributed on the lower part of it (Wang et al. 1999). The mudflat has acted as a major land reserve resource which is currently being developed intensively in China (Wang 1983; Zhang et al. 2013b). It has been proved that soil properties usually reached a stable state in 30-50 years after reclamation (Wang et al. 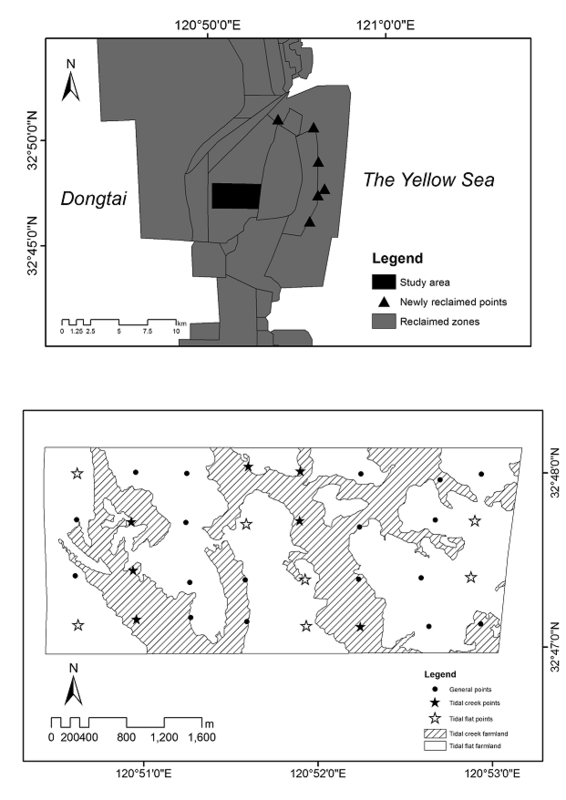 2014a), and they changed most rapidly within the first 15 years of reclamation (Xu et al. 2013). With rapid agricultural, industrial developments and urbanization, the reclamation has extended to “tidal creek zone”, and the micro-relief may influent the edaphic process. Thus, qualifying this influences on soil properties caused by micro-relief is a basic problem to evaluate the efficiency of reclamation, in order to balance human well-being and stability of ecosystem. Geostatistical techniques, such as Kriging, have been used successfully to describe spatial variability of specific parameters (e.g. soil or environmental properties) and to integrate this information into mapping through spatial interpolation. Theoretically, geostatistical techniques are dependent basically on regionalized variable as well on spatial autocorrelation, which means that the closer the samples are in space, the more similarity is in the value (Burgos et al. 2006; Elbasiouny et al. 2014). It can reduce costs by predicting the unknown soil properties with fewer samples (Wu et al. 2003) and show spatial characteristics affected by micro-relief. In this study, the objectives are the following: (1) to detect the relationships among soil properties in the edaphic process after mudflat reclamation, (2) to assess whether soil properties are affected by a tidal creek under the same agriculture activities, and (3) to reveal the spatial variations and characteristics of soil properties. Such an exploration can lighten a path to the understanding of environmental evolution in land reclamation process and to the guidance on the sustainable development of reclaimed zones. The study area is located in the Three Barn reclaimed zone (reclaimed in 1996) in the city of Dongtai in Jiangsu Province, China (Fig. 1). Like most of the reclaimed zones in this region, tidal creek covers 14% of this zone prior to reclamation (Chen and Chen 1999). The climate of the study area is subtropical monsoon with hot, humid summers and mild winters, and with an average annual precipitation of 1051.0 mm and an average temperature of 14.6°C. The major soil types are paddy soil, saltierra and saline soil, and the main crops cultivated in this area are wheat, rice and various vegetables (Jin et al. 2013). A farmland field of approximately 4 km×2 km was selected as the sampling field. This field has not been cultivated until 2006, since then, it was ploughed regularly in a similar manner of rotating rice, wheat and rapeseed throughout the year. (1) Tidal flat is the most widely spread micro-relief form on coastal salt marshes. Large amounts of sediments are carried by tide flows, and deposit from land to sea gradually with forming a slightly incline towards the sea across a broad platform. Halophyte develops on the salt-intruded platform and forms a vegetative landscape structure with clear sea-land gradient, which changes from non-vegetation covered mudflat to Gramineae-dominated (e.g. Imperata cylindrica var. major, Aeluropus littoralis var. sinensis and Phragmiues auszradis) salt marsh. (2) Tidal creek develops in the region where erosion triggered by tidal flow or land-sourced water flow is stronger than in other areas on the mudflat. Halophyte also plays a role in sediment fixing, therefore the coastal wetland is formed by a complex landscape that consists of tidal creek, tidal flat and vegetation. The tidal creek will still be the main channel for tide flow to enter the wetland even when the mudflat is generally over the sea level. With the continuing rush of tidal flow, some tidal flats may be cut and develop to be isolated sandbanks, and some tidal creeks may grow to be “pools” on mudflat. Thus, on Landsat TM images, tidal creek usually shows darker color than the surrounding tidal flat because of its higher water content. It can be more precise to illustrate the distribution of micro-relief with field observation and Landsat images from multi-periods. In October 2013, the sampling field was divided into 32 equally sized grids of approximately 0.25 km2 (0.5 km × 0.5 km) each; among them, 7 grids were categorized as tidal creek farmlands (TCF), and another 7 were typical ones of tidal flat farmlands (TFF). As contrasts, 6 parallel grids were randomly set at newly reclaimed salt marshes (NRSM) that were reclaimed in 2013 (Fig. 2). A composite surface sample was collected in the quadrants of each sampling grid. Another soil samples were collected, prior to the rice harvest so as to avoid soil structure decomposition by harvesters, using the grid method. Each soil sample consisted of a 1 kg soil mixture from a 0–20 cm profile that was obtained using the quartering method, and soil bulk density samples were collected using the cutting ring method. They were stored in airtight plastic bags and taken back to the laboratory. The soil bulk density samples were dried at 105 °C for 24 h, and the other soil samples were air-dried and sieved to 2 mm in a lab setting and then stored before determination of soil chemical properties. In the coastal reclaimed region, soil quality is mainly constrained by physical-chemical properties which can reflect soil salinity, alkalinity, soil texture, organic matter and fertility (Yao et al. 2013) for its mainly use for agriculture. Thus, the following indicators were considered: electrical conductivity (EC), pH, soil bulk density (BD), soil organic matter (SOM), total nitrogen (TN), total phosphorous (TP) and total potassium (TK). The EC was determined using a conductivity meter (METTLER TOLEDO – FE30) on soil slurries at a 1:5 soil-water ratio (shaking 3 min), and the pH was determined using a pH meter (PHS -3C) on soil slurries at a 1:2.5 soil-water ratio (shaking 5 min). The SOM was determined using the hydrated heat-photoelectric-colorimetry method, with K2Cr2O7 (0.8 M), H2SO4 (analytical pure) and C6H12O6H2O (chemical pure) used as chromogenic reagents. The TN was determined using Kjeldahl’s method. Soil samples were dissolved into H2SO4-HClO4 to measure the TP via the molybdenum-antimony anti-spectrophotometric method and the TK via alkali fusion using a flame photometer. Three groups of parallel soil property data from NRSM, TCF and TFF were subjected to a one-way analysis of variance (ANOVA) and checked by least significant difference (LSD) test (P<0.05) using SPSS 18.0 (SPSS, München, Germany) software. The results were used to describe the changes in soil properties after reclamation and compare the differences in soil properties between TCF and TFF. A box plot was applied to show characteristics of samples in each group, which was widely used in soil property studies (Iost et al. 2007). where h is the spatial distance between sampling points; n(h) is the number of sample point pairs when the separation distance is h; Z(xa) and Z(xa + h) are the sample values of variable x at spatial points a and a + h respectively. The normal distribution of each kind of soil properties was tested by the Kolmogorov–Smirnov test (P<0.05) using SPSS 18.0, data log-transformation was used on property not passing the test. Original or log-transformed soil property and coordinate data were entered into GS+ 9.0 for Windows (Gamma Design Software, Michigan, USA) for geostatistical analysis via an OK method. Some parameters such as “Range” and the semivariance calculation model were performed. 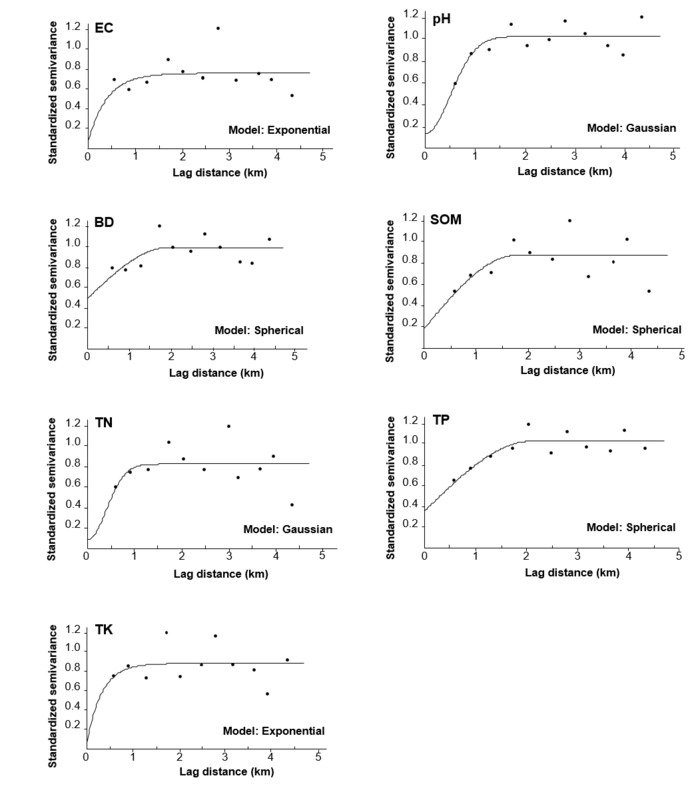 A “Range” was the maximum distance over which the measured soil properties exhibited significant spatial autocorrelation of each property, and it was used to assess the extent on soil property caused by tidal creek. The range and model parameters were entered into “Geostatistical Wizard” module of ArcGIS 10.0 software (ERSI, California, USA) via an OK method (n=32). Finally, the predicted maps of soil properties were obtained, and they were used to demonstrate the spatial variations of soil properties and the affected characteristics of tidal creeks. After 7 year’s cultivation, some significant changes were observed (Fig. 3). The EC dropped dramatically from 4.86 to 0.41 dS/m. The soil pH decreased slightly from 8.81 to 8.36, and the extreme value showed that soil pH can rise to 9.24 or drop to 8.08 under appropriate condition. Soil BD also decreased as an effect of tillage activity from 1.49 to 1.29 g/cm3. Intensive agriculture use caused the SOM to increase roughly twice compare with that of NRSM to 7.41 g/kg. In the process of cultivation, Soil TN and TP accumulated from 0.15 to 0.50 g/kg and 28.42 to 35.64 mg/kg respectively. By contrast, the soil TK, which was 12.17g/kg in NRSM and 12.81 g/kg in TFF, did not show significant change after cultivation. On the different micro-relief types, some farmland soil properties also exhibited differences in the observation (Fig. 3). The soil pH of the TCF with a value of 8.60 was significant higher than that of TFF. The soil bulk density of TCF was also significant higher than that of TFF, thus the TCF’s surface soil demonstrated worse porosity than TFF’s. The SOM and TN of TCF is 5.75 g/kg and 0.38 g/kg, and they only equaled 78% and 76% of TFF respectively. Moreover, a series of extreme low value of SOM (2.97 g/kg) and TN (0.19 g/kg) were observed in a TCF’s soil sample, and they were similar to soil properties of NRSM. The soil EC (ranged from 0.42 to 0.73 dS/m) and TP (ranged from 30.17 to 38.83 mg/kg) of TCF exhibited no significant differences compared with that of TFF. Meanwhile, a soil sample of TCF showed extreme high value of EC (1.29 dS/m), which is in the range of NRSM’s EC. In general, all the soil properties of farmland changed significantly from the initial level except soil TK. With respect to all land use types, the soil TK ranged from 11.26 to 14.07 g/kg. The presence of high soil TK may be attributed to the fact that TK is mainly formed from the soil parent material of this region; thus, there is no need to fertilize with potassium because it is resilient to human activities. The descriptive statistics for soil properties are summarized in Table 1. The mean values of selected soil properties further proved that agriculture management changed soil a lot, in order to make it suitable enough for cultivation. Meanwhile, the minima and maxima value showed huge heterogeneity of soil in the farmland, and some of them were close to the initial level that we described above. As the main characteristics of the coastal region, the soil salinity could still achieve 3.45 g/kg in some sub-fields after 8 years’ cultivation based on the results between EC and total salt content in similar region (Zhang et al. 2013a), yet it was less than 1 g/kg in some other fields. Soil pH had a range from 8.08 to 8.74, which implied that it was alkaline soil in general in our study area. The means of SOM and TN was only 7.17 g/kg and 0.47 g/kg, which were lower than most regular farmland soils in the world. 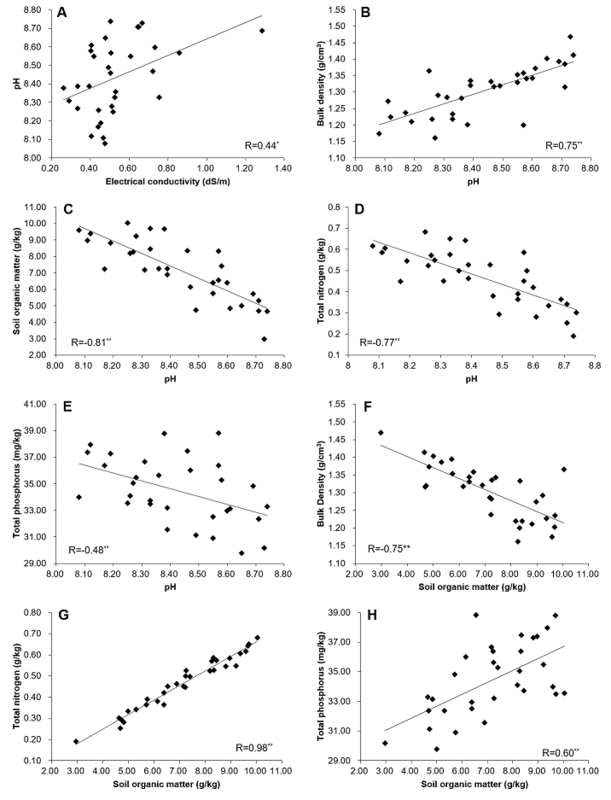 The soil pH exhibited a medium positive correlation with EC (n=32, p<0.05), and the pH decreased with the falling EC, whereas the decreasing trend was not clear when EC was between 0.40 and 0.80 dS/m (Fig. 4A). It indicated that total dissolvable salt didn’t cause soil alkalinity directly, while the components of it deserves more considerations. 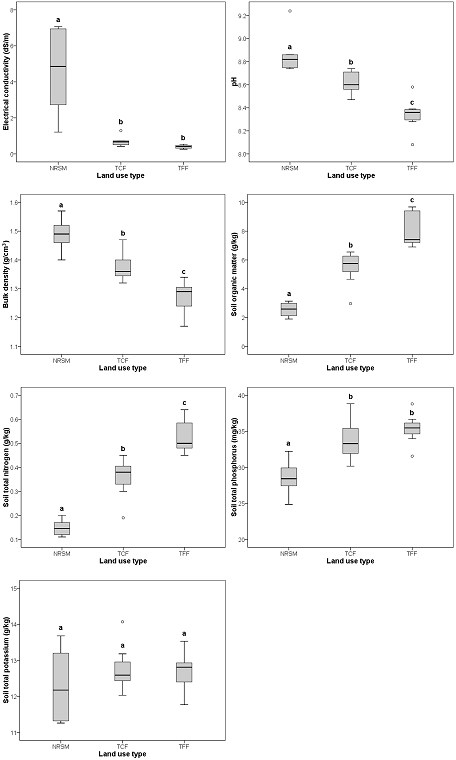 The soil EC did not show significant effects on the other soil properties, although other studies have proven it to be a limiting factor in the process of soil nutrient accumulation (Ondrasek et al. 2011). The soil BD had strong positive, while SOM, TN and TP had strong negative correlation with the pH (n=32, p<0.01). During the decrease of soil pH, the soil BD decreased roughly from 1.47 to 1.17 g/cm3 in linear (Fig. 4 B). Most of the deviated plots existed beneath the trend line, and it indicated that ploughing activity might be another factor to reduce BD. The SOM and TN increased sharply with the decreasing pH, while this trend tended to be gentle after pH was lower than 8.4 (Fig. 4 C, D). In general, soil with higher pH had lower TP, but the correlation is weaker than that between pH and TN (Fig. 4 E). The soil of study area is alkaline, and the high alkalinity limited the accumulations of soil nutrients. The soil BD was strongly inverse correlated with SOM (n=32, p<0.01), and it maintained around 1.25 g/cm3 as SOM increased over 8.00 g/kg (Fig.4 F). The effects of pH and SOM on BD were opposite, and the data showed that soil samples with lower BD usually had both lower pH and higher SOM. However, a few sample plots deviated from the trend lines, exhibited both high pH and SOM or low pH and SOM. Extremely significant positive correlations between TN and SOM were observed (n=32, p<0.01), and the correlation coefficient reached 0.98. It demonstrated a linear correlation between TN and SOM (Fig. 4 G), which implied nearly all of the soil nitrogen exited as organic form. The positive correlation between TP and SOM (n=32, p<0.01) was weaker than that between TN and SOM. With the accumulation of SOM, the growth trend of TP was vulnerable (Fig. 4 H). Soil parent material of this region was lack of phosphorus, and phosphorus could be obtained by chemical fertilizers in the form of inorganic phosphorus, which most part of it was absorbed by crops or lost with water and soil. 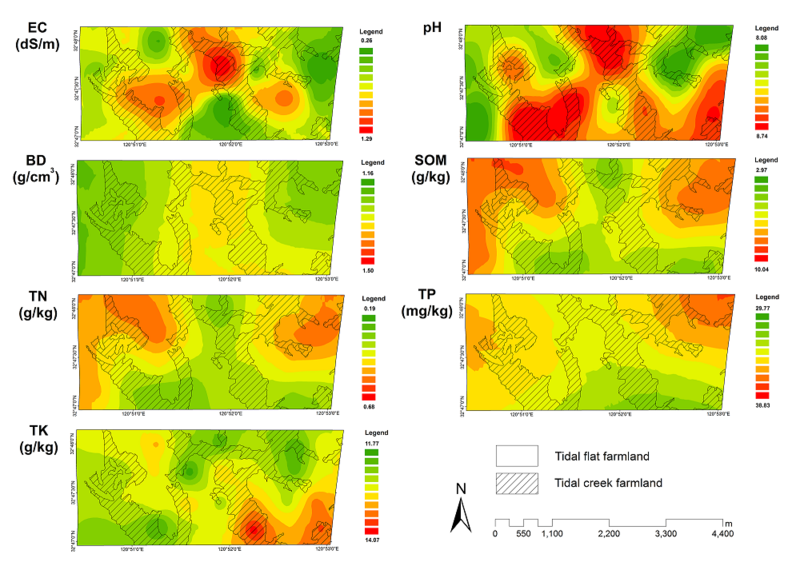 The standardized semivariograms and best-fit models for each of the soil properties are displayed in Fig. 5. In consideration of the shortest sampling interval (about 0.5 km), the ranges of EC (1.08 km) and TK (0.87 km) were too short for their models. This result implied that the effects of micro-relief to soil EC and TK demonstrated in a range of 1 km and the efficiency decreased sharply with the distance. The soil BD, SOM and TP had relatively long ranges, which were over 1.5 km, with Spherical models. Compared with soil EC and TK, the effects of micro-relief to BD, SOM and TP tended to be broad and gentle. The soil pH and TN were fitted by Gaussian models with ranges around 1.1 km. It revealed that they were relatively stable in different micro-relief areas, while the variation tendency was sharp between these areas. The spatial variations of the soil properties in the study field were demonstrated in Fig. 6. The lowest soil EC was distributed in TFF far away from tidal creeks, while the highest was found in the middle of this field, where tidal creeks were concentrated. The high soil ECs also existed near the TCF, and it might be caused by the movements of soil dissolved salt flowed with irrigated water. The TCF covered the most parts of the field with high pH, and the soil pH decreased in the direction of tidal creeks. The high soil BD mainly distributed in the tidal creek concentrated area, where it accompanied with the relatively high EC or pH. The variation of the soil BD revealed that it was related more to the patterns of tidal creeks than to the shape of a single one. In general, the SOM and TN had similar spatial variations, which were supported by the high positive correlation described above. Their spatial variations were fitted with the shapes of tidal creeks, and they increased both in the direction of tidal creeks and the transition from TCF to TFF. Micro-relief factors also limited the phosphorus accumulation in the soil, but its trend was smoother than those of TN and SOM. The lowest soil TP didn’t existed in the TCF with low SOM, nor did the highest ones existed in some TFFs with high SOM. There was no clear tendency to show that soil TK was influenced by micro-relief factors, and it further proved that micro-relief had no significant effect on soil TK after cultivation for 8 years. On the natural mudflat, the soil is characterized by high salinity, alkalinity and bulk density, and relative low organic matter and nutrients (Meng et al. 2013). It showed as no differences as the soil properties in the NRSM, for the reason that low quantities of vegetation and microbe communities generated in the area (Mao et al. 2010). Sun et al (Sun et al. 2011) reported that the spatial heterogeneity of reclaimed alluvial soils differed from natural ones due to reclaimed time and land use types, and farmland provided the best contribution on the soil function maturity process. The reclaimed time of the study area was less than 20 years, in which was proved to be a rapid desalination phase (Xu et al. 2013).The desalination process is due to high annual precipitation of approximately 1051.0 mm and the appropriate tillage management procedures, such as rice field-upland field rotation (Fu et al. 2014). Due to high lime content in the soil parent material, the de-alkalization process is more variable than the desalination process. Desalination lowers the contents of salt cations and anions in soils including hydrogen carbonate (HCO3-) and calcium (Ca2+). The loss in HCO3- directly causes the decline of soil pH, while a loss in Ca2+ affects the balance of CaCO3-H2O-CO3, which rises the contents of HCO3- again (Wild et al. 1981). The presence of structural development is a primary indicator of alluvial soil ripening (Ellis and Atherton 2003). The most recently reclaimed marine sediments undergo a shrinkage process over cycles of wetting and drying (Kim et al. 1992; Kim et al. 1993), and this process results in high soil bulk density. Usually, improved soil saline-alkali environment and porosity make crops grow normally under plenty use of fertilization. In the establishment of agriculture ecosystem, SOM, TN and TP accumulated in the soil as same as previous found in Shanghai (Cui et al. 2012). However, tidal creek changes the hydrological characteristics in the reclaimed mudflat. The TCF has high water tables, it may be attributable to the fact that it exhibits lower terrain compared to surrounding TFF (Guo and Jiao 2007). Hence, salinity groundwater is maintained in TCF more effectively than in TFF via evaporation, where soil desalinization and de-alkalization process are hindered. Although soil porosity is improved by tillage activities, alkalized soil compaction also offsets some of these effects. TCF may develop higher soil BD, salinity and alkalinity than TFF, and these properties strongly limited crop’s growth, which leads less biomass to be stored in the carbon and nitrogen cycling pools (Hubbard et al. 2013). Original soil TP is mainly derived from marine sediments, and fertilization is the only approach through which phosphorus can accumulate after reclamation (Mao et al. 2010). In TCF, poor crop’s growth causes less phosphorus was absorbed, while the fertilized inorganic phosphorus is flushed out easily through surface drainage (Fu et al. 2014). Due to high salinity levels in the TCF, the high K+ content in the soil water restricted K-mineral weathering (Iost et al. 2007). Echoing Fu’s findings (Fu et al. 2014), wheat-rice rotation in the TFF returned potassium to the soil, thus keeping the TK levels stable in this area. In the view of relative large spatial-temporal scales, previous studies identified sea-land gradients of soil properties. From shoreline to inland, reclaimed time is the main factor which causes soil salinity decreasing (Yin et al. 2016) and SOM increasing (Jin et al. 2013). Land use history is another important factor to impact the spatial variations of soil properties (Wang et al. 2014a) which have different ranges. Soil salinity has strong variability caused by rainfall and irrigated water (Shi et al. 2005), soil dissolved salt is leached to deeper layer or brought by water flow in ditch system to TFF near TCF. Soil pH is actually controlled by HCO3- and Ca2+ (Yin et al. 2016) in the reclaimed zone, so it is a continuation of desalinization. The range of soil pH is larger than salinity, covers not only TCF, but also TFF around it. To normal crops, high soil salinity limits their growth, while high pH reduces availability of soil nutrients, further it could affect the stick of carbon, nitrogen and phosphorus in the soil (Zhao et al. 2016). Thus, De-alkalization is a process which is more complicated than desalination, when most salt cations and anions have been leached, lots of alkaline anions are still kept in the soil and reduce the sustainability of soil nutrients especially nitrogen and phosphorus, thus reducing and controlling soil alkalinity is the key point in the post-desalination stage in order to improve the soil nutrient quality. High intensity of mudflat extends reclamation to areas with zero-bellowed elevation, and it dramatically reduces the initial soil quality. Hence, micro-relief caused hydrological differences are becoming widespread in recent reclaimed zones. The variance of soil physical-chemical properties reflects the effects of typical micro-relief on soil development and can be used as a reference for future studies. Numerous studies have found that unsuitable reclamation activities can lead to ecological risks (Goss-Custard and Yates 1992; Mitsch and Gosselink 2000; Sato and Azuma 2002). Tillage activities can break down soil aggregates and cause soil nutrient loss (Wang et al. 2012) during earlier stages, especially in regions that are characterized by immature soils (She et al. 2014). Compared with local, natural and salt-tolerant procedures, agricultural practices hinder soil development, production and ecosystem services (Gao et al. 2007). Further, intensive fertilization practices and high degrees of soil erosion lead to nearby soil and water pollution and regional eutrophication (Abdallah 2011). Thus, we advise that agricultural development be postponed and that tidal creeks be held at a natural succession status after reclamation. Otherwise, sufficient ecological approaches appear to more effectively facilitate post-reclamation progress. After mudflat was reclaimed, short-term cropping activities affected soil physical-chemical properties significantly. Irrigation and tillage activities dramatically decreased the soil salinity, pH and bulk density, while fertilization improved SOM, TN and TP contents in this process with the exception of TK. Soil properties reached an acceptable level for cultivation of most farming crop’s growth in TFF. However, tidal creek hindered the edaphic process. Soil pH and BD in TCF were higher, while SOM and TN were lower than in TFF. TCF was unsuitable for crop growing, even after 20 years of reclamation. Soil salinity had high variability and the smallest affected range caused by tidal creek, and it was also high in some points near TCF. Soil pH was both high in TCF and TFF around it, it was the key factor in limiting soil BD, SOM, TN and TP after 20 years’ reclamation. Soil TK still didn’t show clearly affected by tidal creek. The soil properties variated in the reclaimed areas examined in this study resulted from the combined effects of tidal creek presence and coastline distance. This study provides a more specific analysis than former studies to qualify the affected ranges caused by tidal creek after reclamation. Other factors, such as crop types and rotation rules, can also affect soil properties, and these factors must be examined in future studies to fully understand such processes. This research was supported by the National Natural Science Foundation of China (no. 41230751). 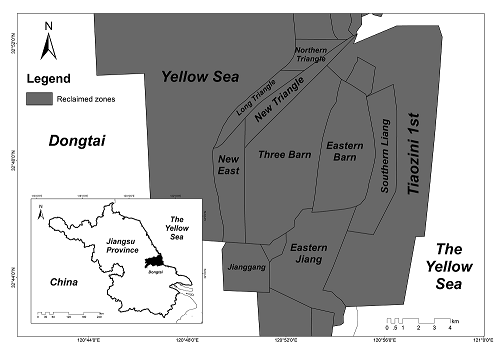 Chen H, Chen X (1999) Reclamation zones in the coastal region of Jiangsu Province. Ocean Press, Beijing. Oliver, M. A (2001) Geostatistics for environmental scientists. John Wiley & Sons. Ondrasek G, Rengel Z, Veres S (2011) Soil Salinisation and Salt Stress in Crop Production. Abiotic Stress in Plants - Mechanisms and Adaptations. Perillo GM, Wolanski E, Cahoon DR, Brinson MM (2009) Coastal wetlands: an integrated ecosystem approach. Elsevier. Wild A et al. (1981) The chemistry of soil processes. vol Monograph.